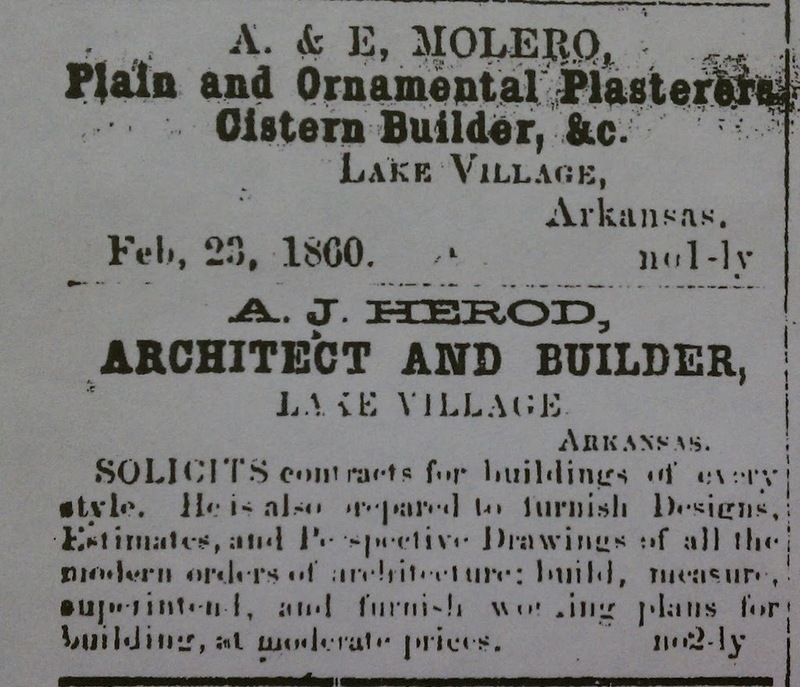 In an 1870 Chicot County newspaper two craftsmen advertise their services. Architect and builder J.W. Trawick is an “Architect and Builder” at “Luna, Ark.” He “solicits contracts for buildings of every style, and will promptly perform all work in his line.” Your “Satisfaction is guaranteed” he states confidently. In the 1870 Census, Trawick is listed as a thirty-four year old carpenter. Living at Luna Landing, he was born in North Carolina, as was Jane (sp? ), his thirty-three year old wife. 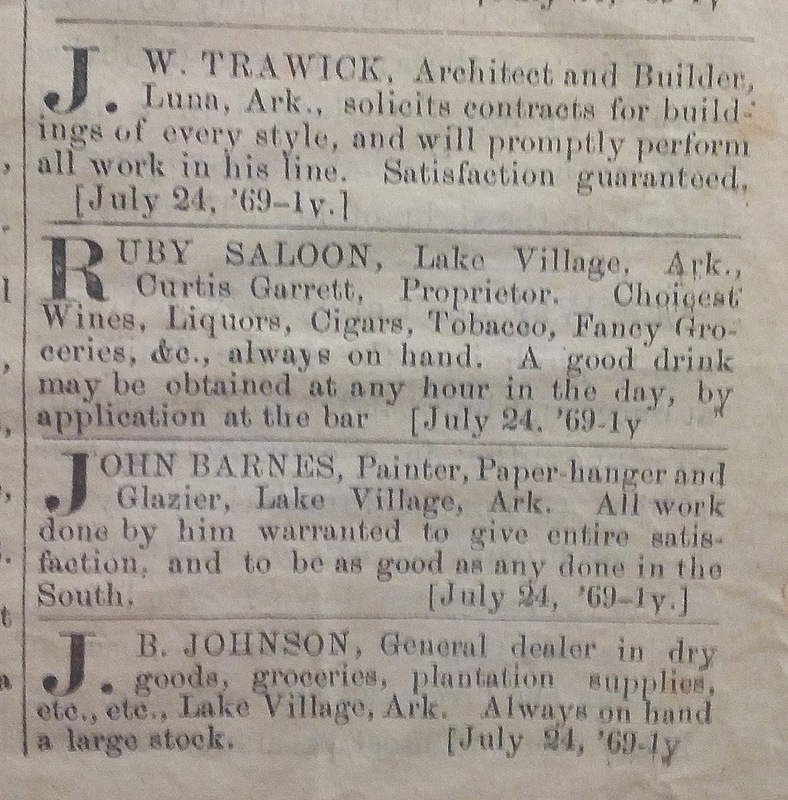 John Barnes, a “Painter, Paper-hanger and Glazier” also advertised his services. Barnes offered a more verbose and sweeping guarantee: “All work done by him warranted to give entire satisfaction, and to be as good as any done in the South.” In the 1870 Census, Barnes is a thirty year old painter. Living at Lake Village, he was born in Illinois; his wife, Mary Jane, age eighteen, was a native Arkansan. SOLICITS contracts for buildings of every style. He is also prepared to furnish Designs, Estimates, and Perspective Drawings of all the modern orders of architecture: build, measure, superintend, and furnish working plans for building at modest prices. Herod, a Mississippi native, was later appointed Mississippi’s State Architect by Governor Benjamin G. Humphreys in 1865. However, little is known about Herod, and by 1870 he was farming in Yazoo County, Mississippi. 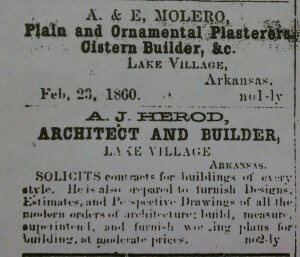 Above Herod’s 1861 advertisement is an ad for A & E Molero, Plain and Ornamental Plasters and Cistern Builder. In the 1860 Census, Edward and William Molero are English born plasters, likely brothers, ages twenty-six and thirty-five. They are living in the Packet House Hotel with a number of Lake Village notables (lawyers, a printer, a merchant, a mechanic/builder and a physician), including Daniel H. Reynolds and William B. Street. A year later the British-born plasterers had been recruited into Reynolds’ Chicot Rangers. The Moleros settled in Meridian, Mississippi, where Edward appears in the 1870 Census and William in the 1910 Census. John T. McMurray, 23, painter, born in Jamaica, Residing at the Parker House Hotel. John C. C. Bayne, 30, painter, born in Georgia. Living with his family.